Our weekend in Santa Cruz was awesome. 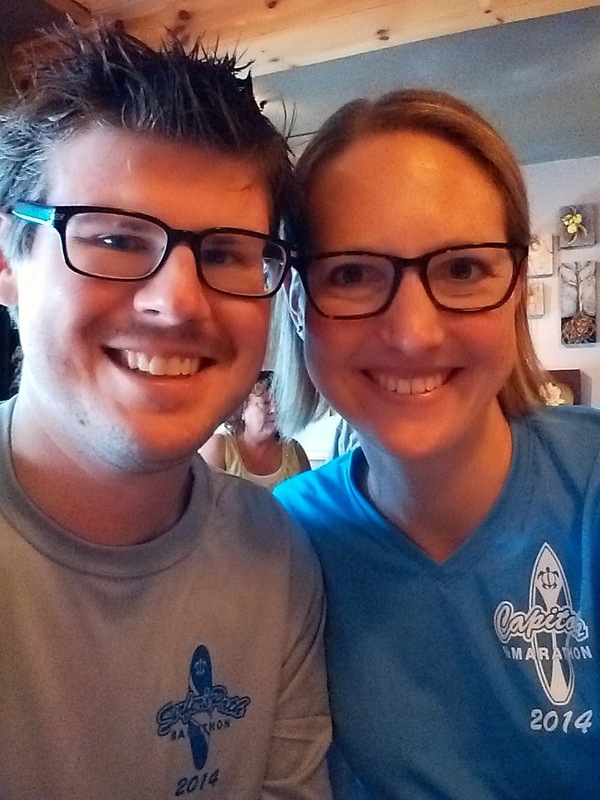 Although we've day tripped to the boardwalk or to a race there in the past, we'd never actually stayed the weekend to visit the beach, the restaurants, and the local bars. This past weekend we headed down on Saturday after lunch and then stayed through Monday. 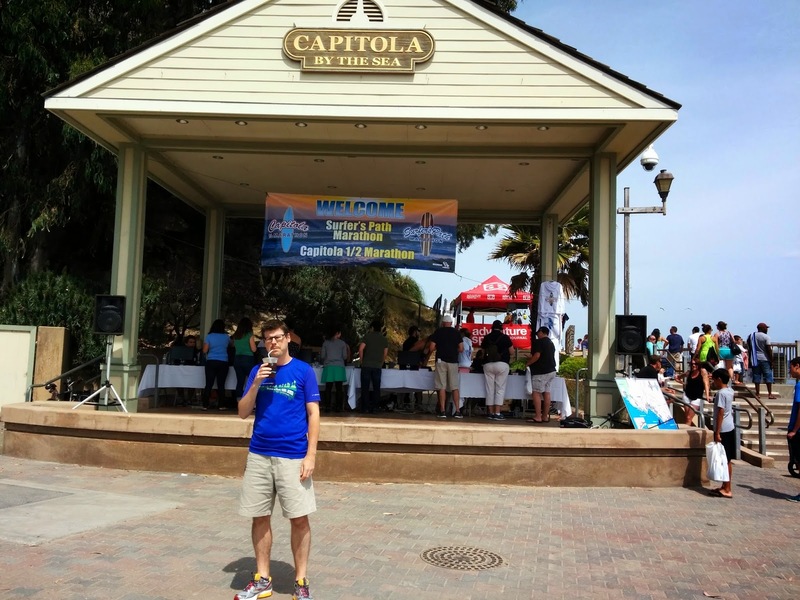 Our first stop was Capitola for packet pick-up; Kevin ran the Surfer's Path Marathon and I ran the Capitola Half. I like how this race company brands each event separately from the names to the swag. The fact that they do this for such a small event is really cool - the marathon was less than 500 people and the half was about 1300. The expo was at the beach, with registration and bib pick-up in the bandstand and vendor tents along the sidewalk. It was small but sufficient, including a few local races, running stores, and fuel companies. Kevin, who couldn't be bothered to stop drinking his iced coffee for a photo op. After getting the race goods, we headed to our hotel (Santa Cruz Dream Inn) and discovered it was literally right on the beach, right at the finish line. Win! I booked it based on the race website's travel section, but I guess it didn't dawn on me how great the location really was. We relaxed to the sound of the ocean, enjoyed our beach view from the balcony, and met up with Alisyn and a friend for dinner. We turned in pretty early for the next day's 7 am race start. Morning came quickly. I wasn't nervous the day before, but the morning of the race I suddenly got spooked and didn't want to run. Silly, I know, but I hadn't run more than 10.5 miles since January. I didn't feel ready, I didn't like my shoes, I worried I would crash and burn or that my hip would hurt. Basically, I was letting my mental state go to pieces. Where was that confidence I found in the 10K only a week before? Then there was Kevin, the one running the marathon who was cool as a cucumber and calming me down; he's great at that job. We met up with our friend Derek and headed out to the start area. There aren't any specified corrals or pace groups for this race, so you can line up where you see fit. After a rendition of the Star Spangled Banner from a Beach Boys album to keep with the surfing theme, we headed on our way. I think people did a nice job of starting in an appropriate pace area because I didn't feel crowded or stuck behind people at any time. We ran along the boardwalk area and then headed uphill and followed the coast. The views were gorgeous: ocean, cliffs, trees, sand. Running along water is one of my favorite things. This is definitely not an easy course because it has many uphill and downhill sections throughout both the half and full. After about 6 miles we headed downhill into the town of Capitola, made a loop, and then headed back the way we came. 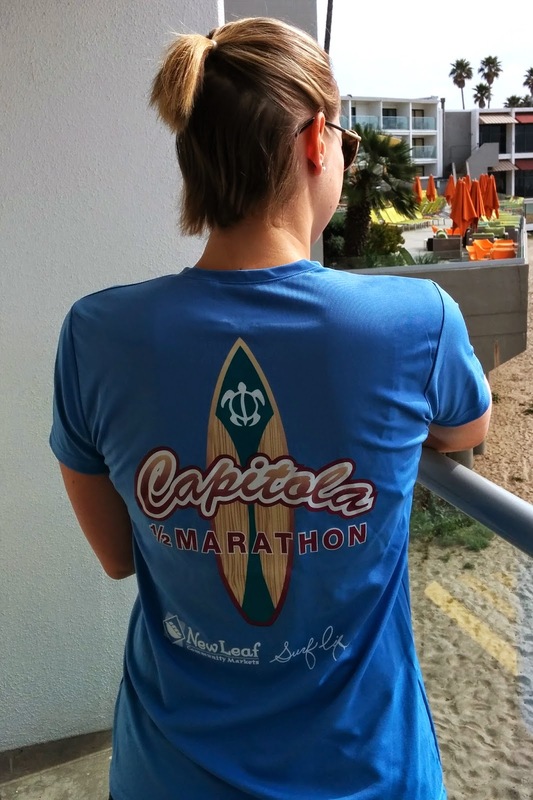 There is also a 2-person half marathon relay event which switched off during the loop we made near Capitola beach. From there, the course followed mostly the same route back. One hard part about an out and back is knowing any hill you enjoyed running down is later going to be a climb. The hill down into Capitola was super fun to run down except that the whole time I was thinking the uphill would be terrible, but somehow the uphill was totally fine and felt shorter than going down. How did that happen? And a big bonus about the out and back is watching for and waving to everyone you know that's going the opposite way. So entertaining. As far as my race goes, I felt just ok and far from great. The beginning felt hard, probably because I'd gotten so nervous. I took a few short walk breaks; even 20-30 seconds here and there, such as on a tough spot or to take fluids, helps to ground me and calm my 'what if I crash' nerves when I'm feeling off. 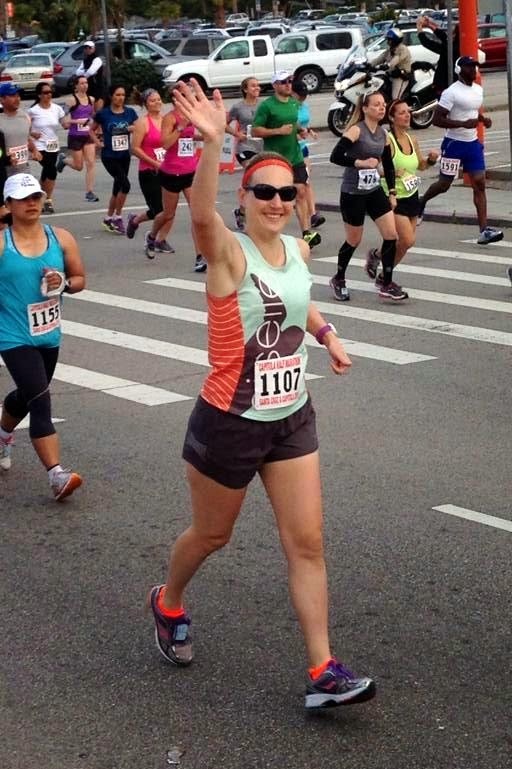 Around mile 9 I became aware of the work in my quads and started worrying about my hip flexor. 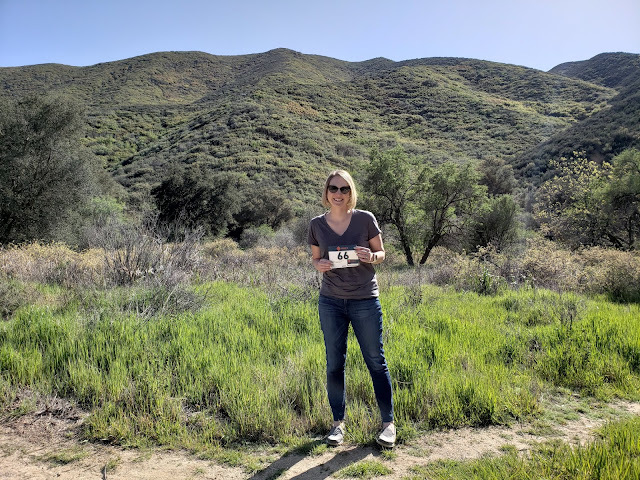 By mile 10 or 11 my feet were bothering me and my shoes felt like they had no support left, so all I could think about was the sensation of my feet slapping the ground. I focused on forward movement no matter how fast it was and luckily had a few downhill portions to give me momentum. The last couple of miles weren't pretty, but I managed to get there and to run a strong last half mile into the finish. Turning the corner from the street into the sand is always fun - providing you remember that you are about to land in sand. Sand is very soft. The first time I ever did a beach finish I was oh-so-close to biting it in the sand. 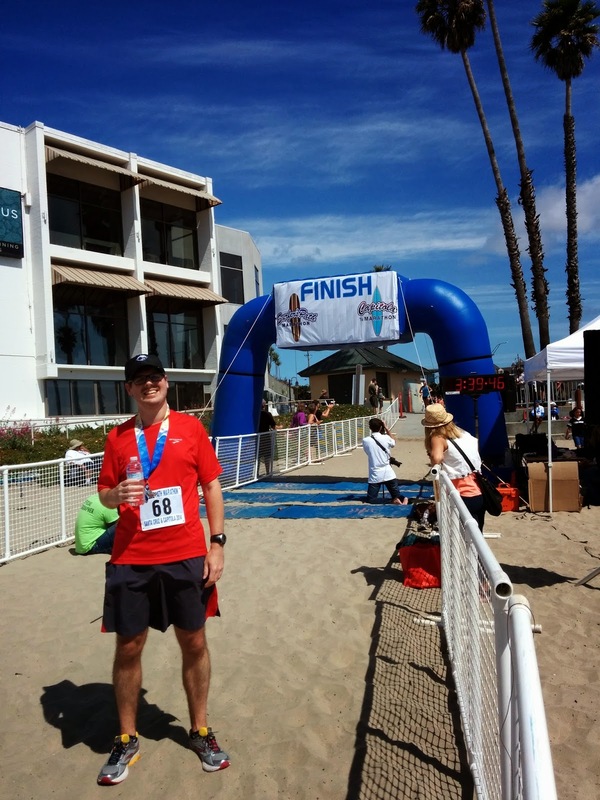 This time all was well and I crossed the finish line with an official time of 2:04:40. Although not a PR, I'm happy with that as a comeback half time - especially on an off day - that I can hopefully build on this year. After the race I did a quick clothing change in hotel, hung out on the beach with Alisyn, and helped with awards distribution because they needed an extra volunteer. I was expecting Kevin around 3:45 or maybe a bit later (the course was much harder and warmer than his PR in Houston.) The next thing I know, I'm looking over and Kevin is breezing through the finish line at 3:38 for yet another marathon PR. He totally rocked it! Kevin ran with Derek through the half, and with a 1:40 or so half time they both PR'd that distance. Congrats to Derek on the new half PR! Considering Kevin ran a half PR time during a full, I'm guessing he's ready for a faster half marathon too. 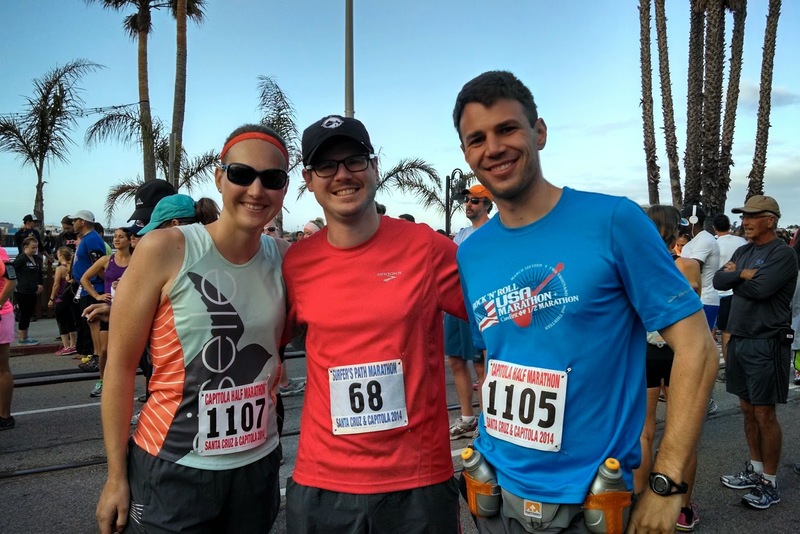 I also have to give a shout out to friends with new PRs at the event - Elise in the half, Meg in the 10K part of the relay, Josh in the marathon - you guys are awesome! The support. On course support was pretty good. They had plenty of aid stations with water and electrolyte drink and one aid station on the half course with gels. There were a couple of porta-potties near most aid stations and they didn't seem to have lines. There were tons of course marshals watching intersections and making sure we knew where to go, plus many police officers keeping traffic out of our way. The course. I loved the course and all of the ocean views, although note it's a bit harder than the elevation profile led me to think it would be. I didn't experience any crowding at the start or anywhere on the course for that matter, even when we went down to thinner sections or turns. The route is very exposed to sun and could be to wind; luckily it wasn't windy that day. The half course is all pavement, but the marathon course has a dirt section along the ocean. The finish line. Finishing on the beach was fantastic! They had as much regular water and Zico Coconut Water as you wanted (even chocolate-flavored), massage, music, and a party atmosphere. Each runner received a brown bag of food sponsored by a local store, which included an orange, a banana, granola type bars, a tasty locally-made cookie, and a bagel. 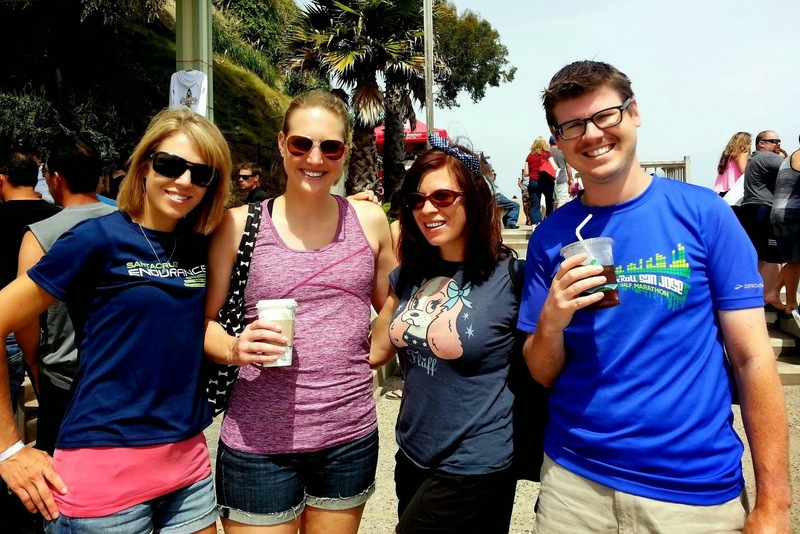 It seemed like people hung out longer than at other finish lines to enjoy the beach and the ocean cliffs. The swag. I'm a big fan of the race shirts and medals for this event. 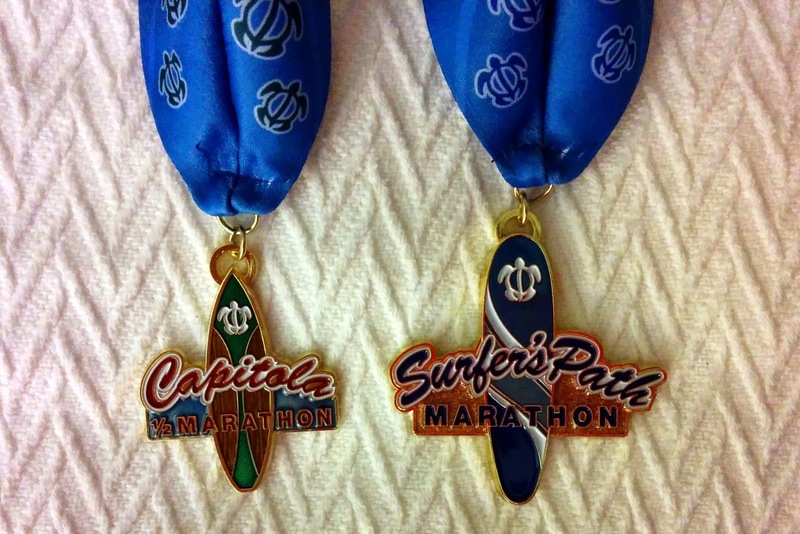 Both items were event specific for the marathon, half marathon, or relay. I'm generally not a fan of race shirts, but I like the quality and fit of the v-neck women's cut tech tee a lot. 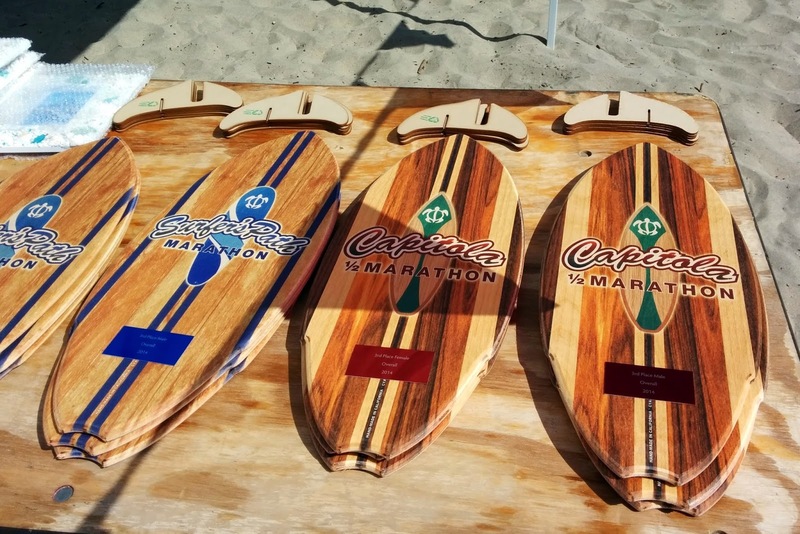 This race also has awesome awards for the winners - overall winners get custom made mini-surfboards and age group winners get beach-themed photo frame awards. Stalking the awards table and wishing I was that fast. Can I buy one of these? 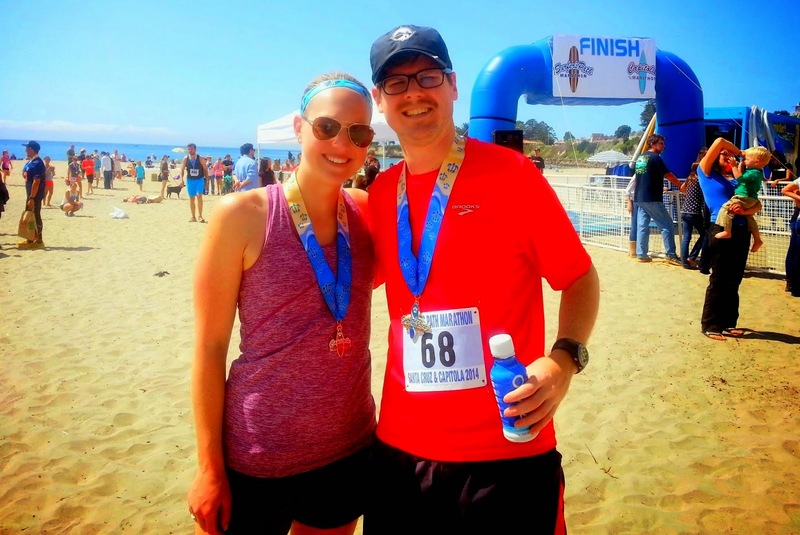 All in all, I highly recommend this race to anyone who loves beaches and ocean view courses. Santa Cruz is a fantastic place for a weekend race getaway. Congrats on the race! It looks like a fun one. I love running along the ocean! Okay, that's definitely going on my race calendar for next year! Though running in the sand to the finish doesn't sound fun. haha. Congrats again on finishing and to Kevin on a PR! Congrats all around -- to Kevin on a half and full PR AND to you for a strong post-injury performance! Almost signed up for the full but knew I wasn't trained enough yet. Looks good though except a bit warm. But I do love the small homey races and how well they treat you. Congrats to Kevin..I would say yes he's due for a half PR ...and another marathon PR with a cooler and easier course. 2:04 not to shabby considering....glad the flexor is staying on the mend.